Disney/Pixar’s Up is one of my favorite Pixar movies! I know we could’ve easily dressed up as Carl and Ellie or as Carl and Russell for Halloween but I wanted more of a challenge so I decide we could be Russell and Kevin the Bird (Snipe!) 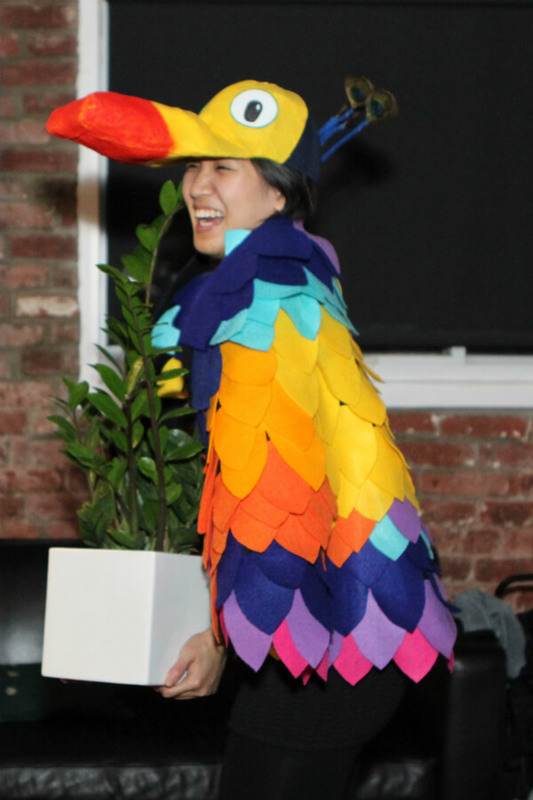 Most of the female Kevin costumes involved wearing a colorful tutu, but I wasn’t a fan. Then I stumbled up on this version that Creatively Christy made for her kids and I decided I wanted to make an adult version! 1. 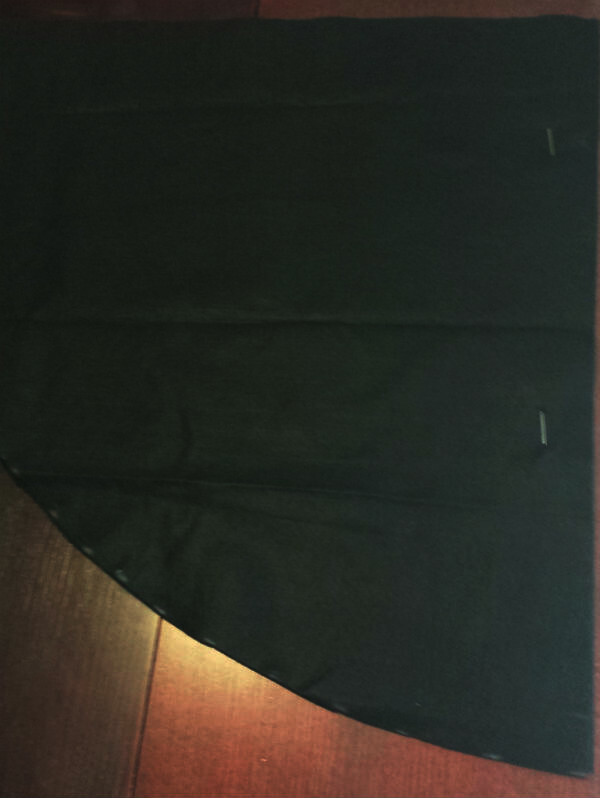 Cut a half circle out of the large black felt sheet. I folded the sheet in half the diagonal way and used chalk to mark a consistent radius from the top corner to make a quarter circle. 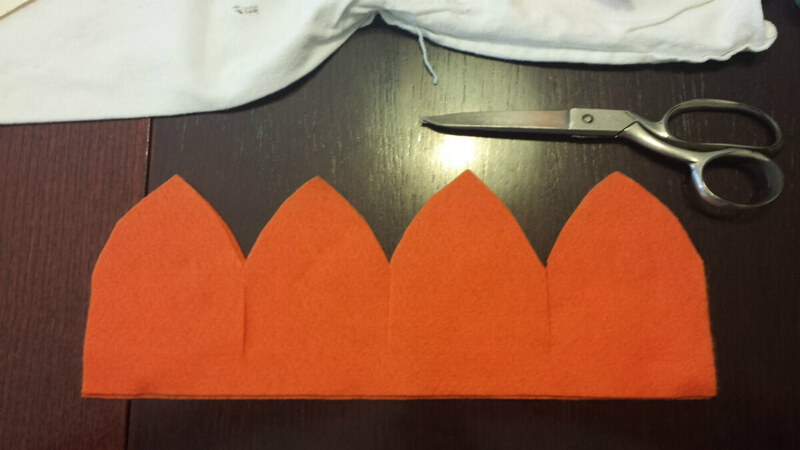 Once you cut along that radius, you’ll end up with two quarter circle sheets and you’ll need to just sew the straight ends up together. 2. 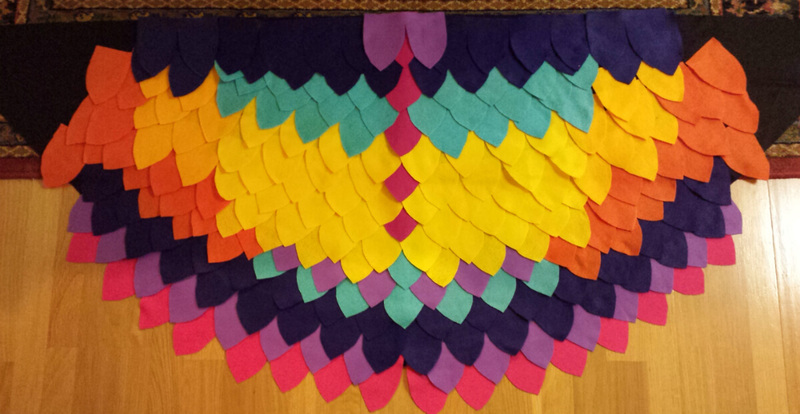 Cut out rows of felt feathers. 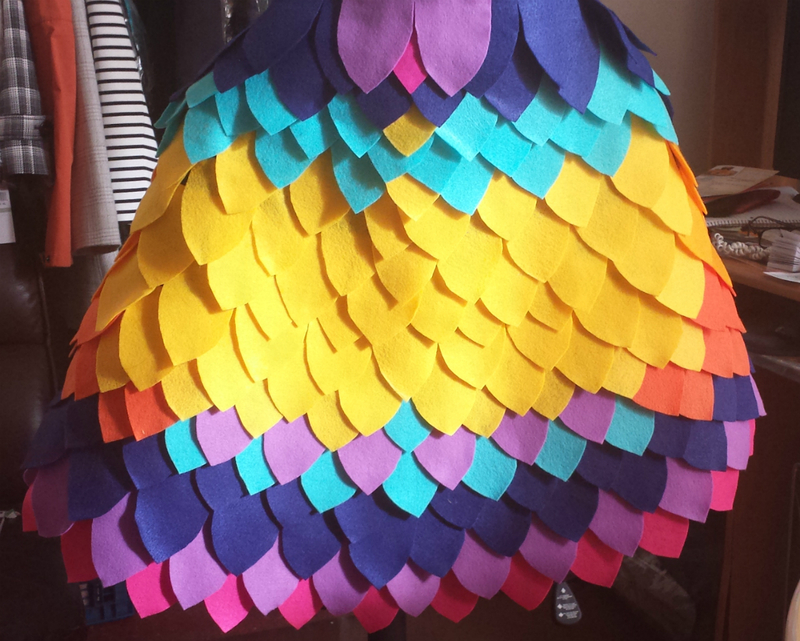 I used an old folder for my feather shape but you can use any sheet of paper or card stock. 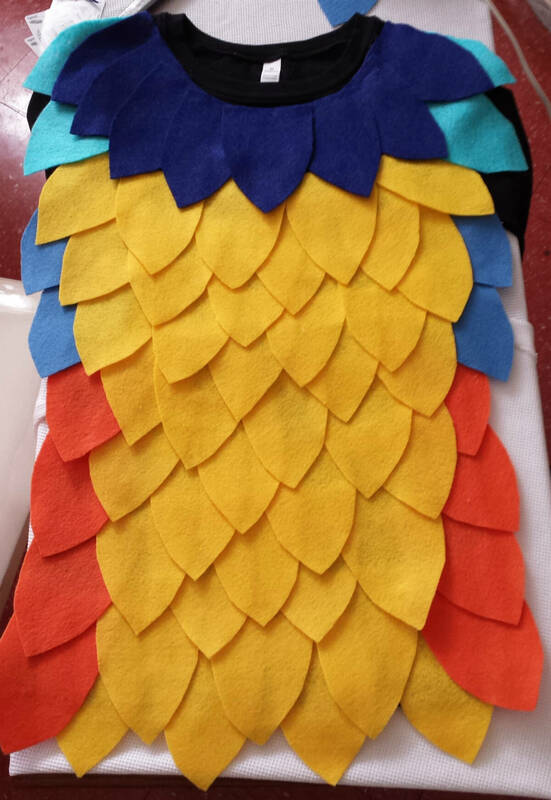 I realized I could fit 4 feathers on one sheet of felt (the long way), so I folded the felt sheet in half, secured the two pieces together with some pins, traced the outline of the template, and cut out the outline along with gaps in between to yield 2 rows of feathers. 3. 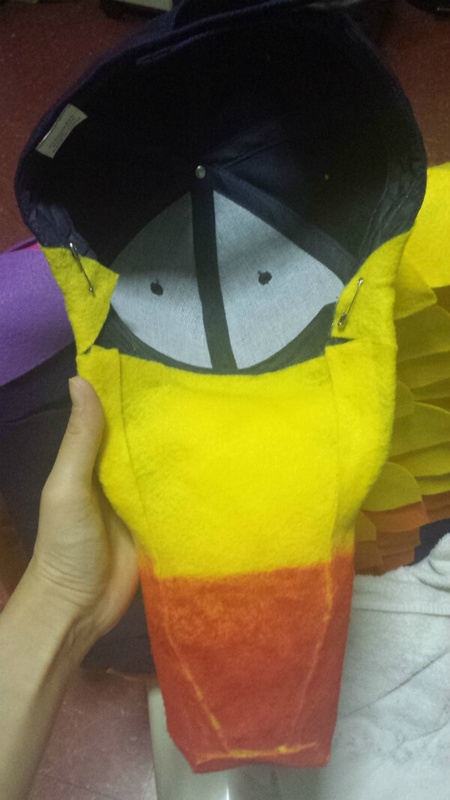 Lay out your feathers on top of the black felt in your desired color pattern. 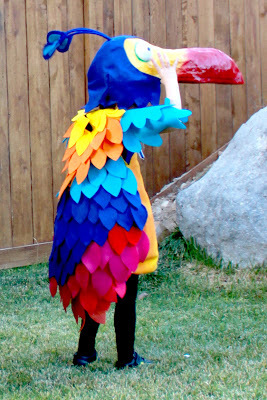 This helps you check to see if you actually have enough feathers, and get them in place for gluing. If there are any gaps in the spaces where the feathers are spread in an arc, I just used single or double feathers to fill them up. 4. 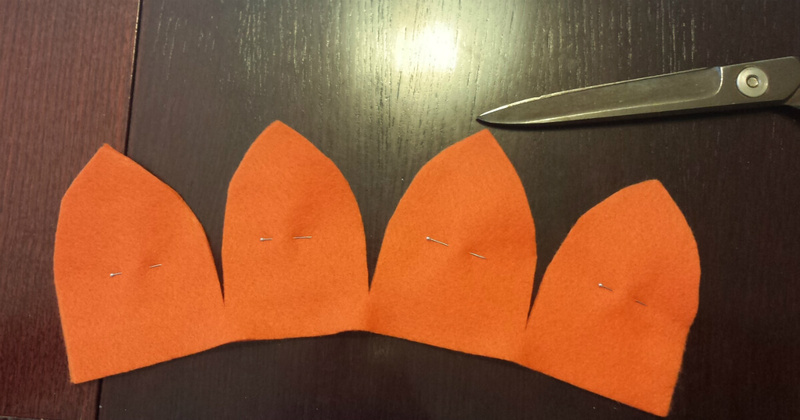 Use the hot glue gun to glue the top of each feather row to your cape. I specifically avoided gluing the entire feather down to 1) let the feathers move more freely and 2) not use as many glue gun sticks, because those guys melt down quickly! 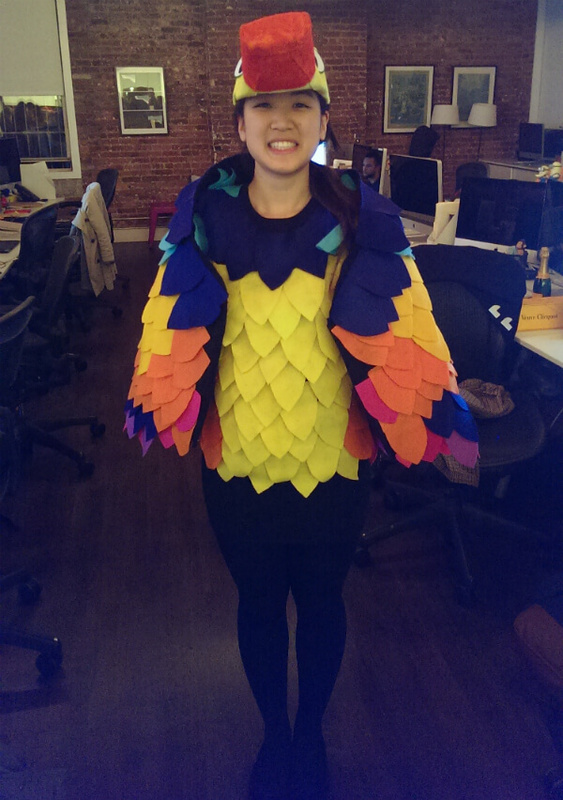 We started from the bottom most feathers and made our way up to the top. 5. To make the arm straps on the back side of the cape, you’ll need someone else’s help to mark the spots for where to fasten the fabric strips. Didn’t have anyone take a picture of us for this but essentially I draped the cape around my shoulders and Jeff marked the top and bottom areas surrounding my armpit and we just pinned the fabric straps (with some slack) until it fit properly. If you are using a hoodie then you can skip this step! 6. 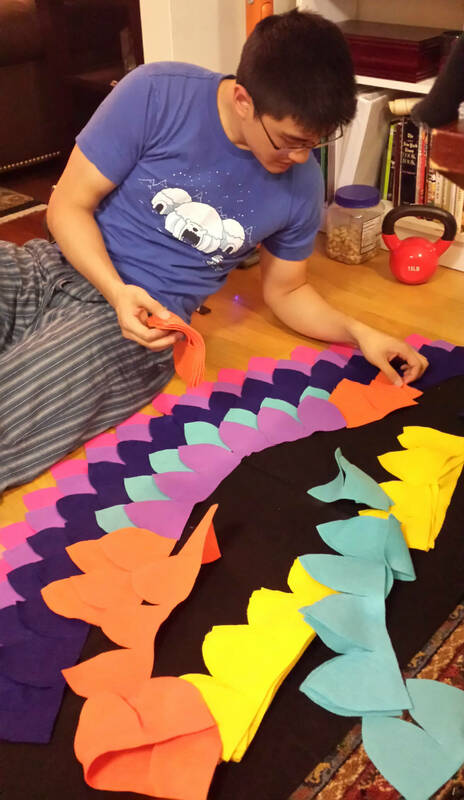 Now that the cape is done, time to make the body! 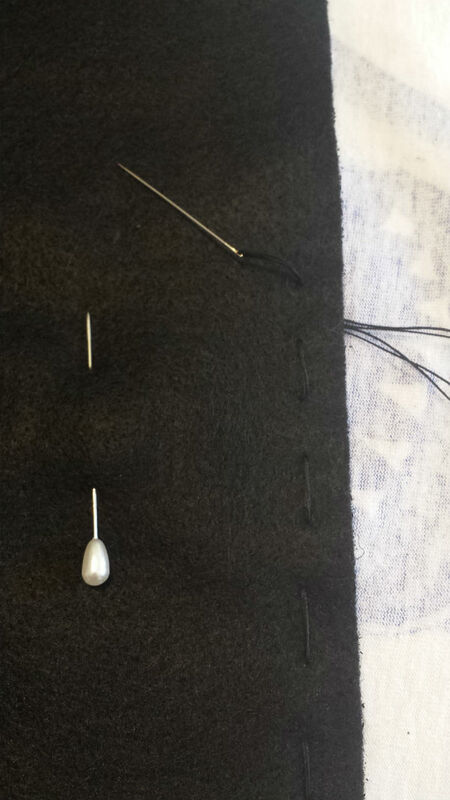 Repeat steps 3 and 4 on the black t-shirt/front of hoodie in the pattern you want. 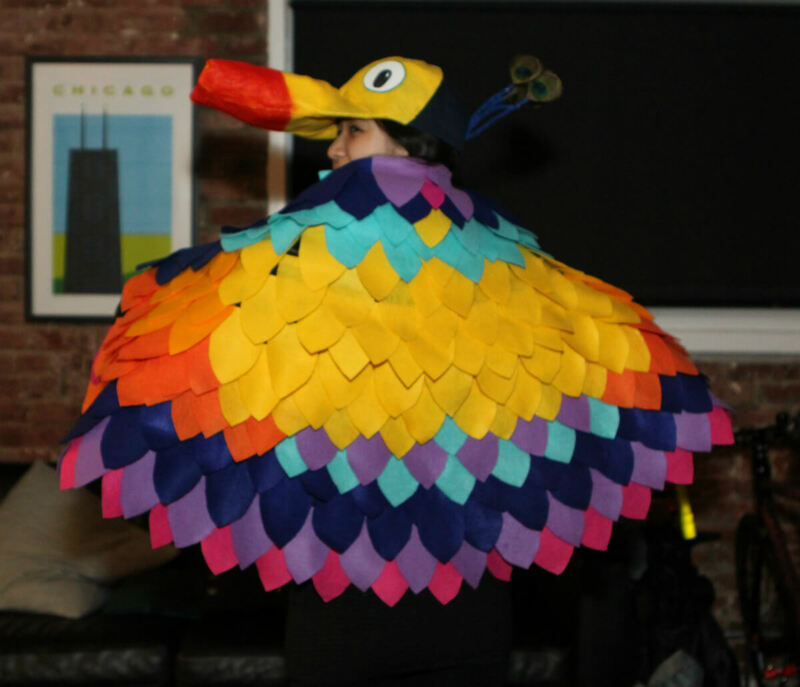 Unfortunately I don’t have many photos for this section because it was late at night and I was pretty much winging it because nobody at the time had a tutorial for how to make the head without either 1) wearing the actual beak on your nose or 2) making it out of paper maché. 1. 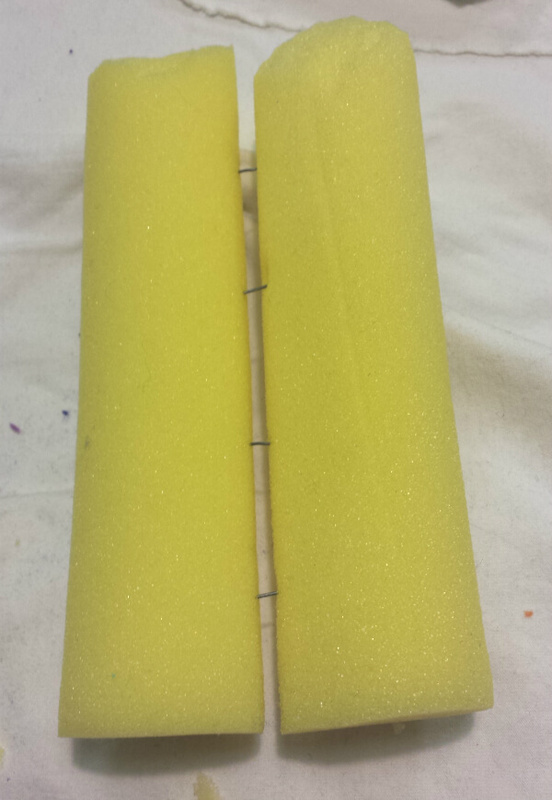 Attach the 2 foam paint rollers together. You could probably wrap tape around the center but for some odd reason I decided to unravel a paper clip to stick the two foam pieces together. 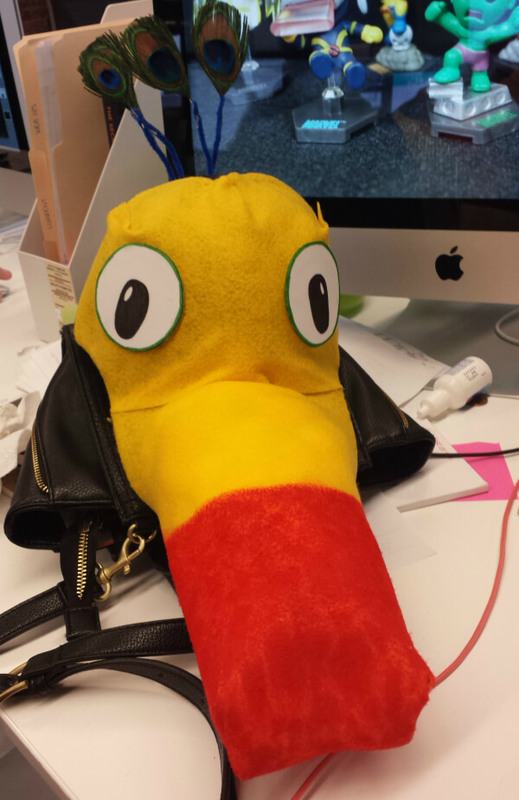 After that I used a scissor to cut off the edge of the foam to form the beak shape. 2. 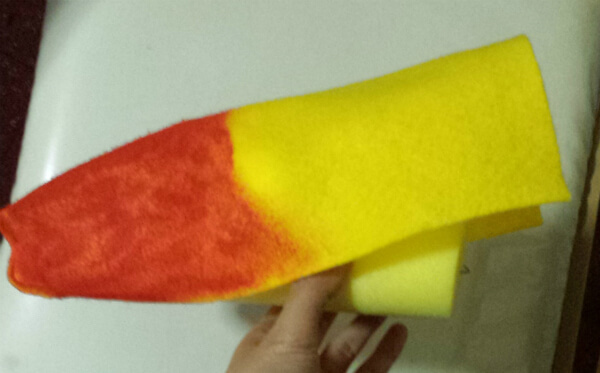 Wrap the foam rollers with the yellow felt and glue gun the two pieces to form the shape of the beak. 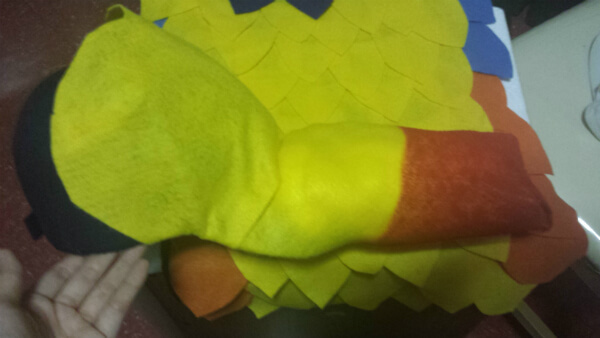 You can also use red felt to do the front of the beak but I didn’t have any so I painted the front of the beak with red acrylic paint. 4. 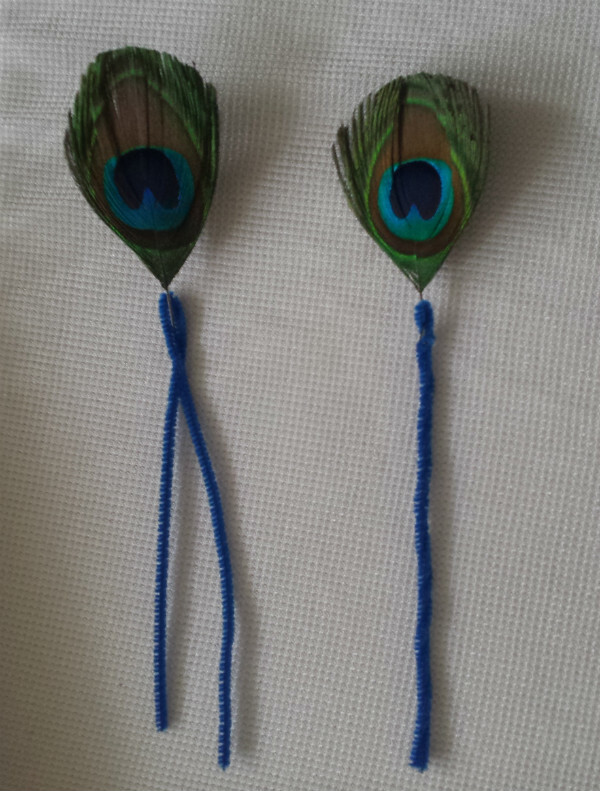 Fold your pipe cleaner in half and twist it around the base of the feather’s stem. 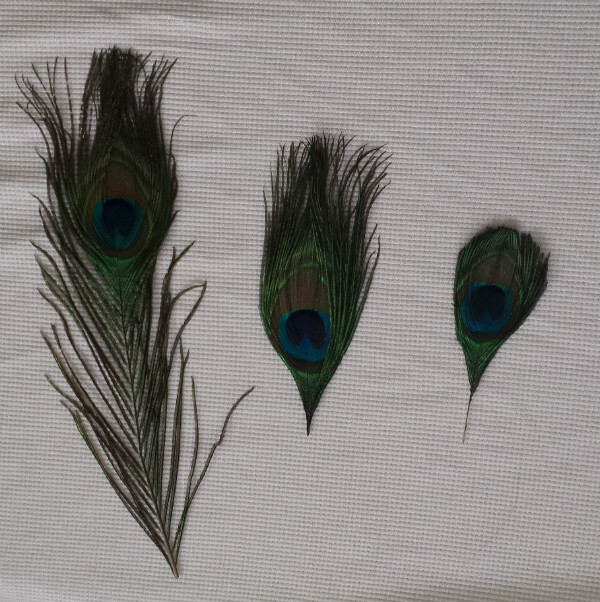 The peacock feathers I bought were a bit large so I plucked off the bottom feathers to make this stem. I forget how I secured the pipe cleaner to the back of the cap but I’m going to guess by glue gunning a small piece of felt across the pipe cleaners and onto the cap. If you want to go the extra mile, you can also probably find kids camp for the rest of his backpack accessories. 1. 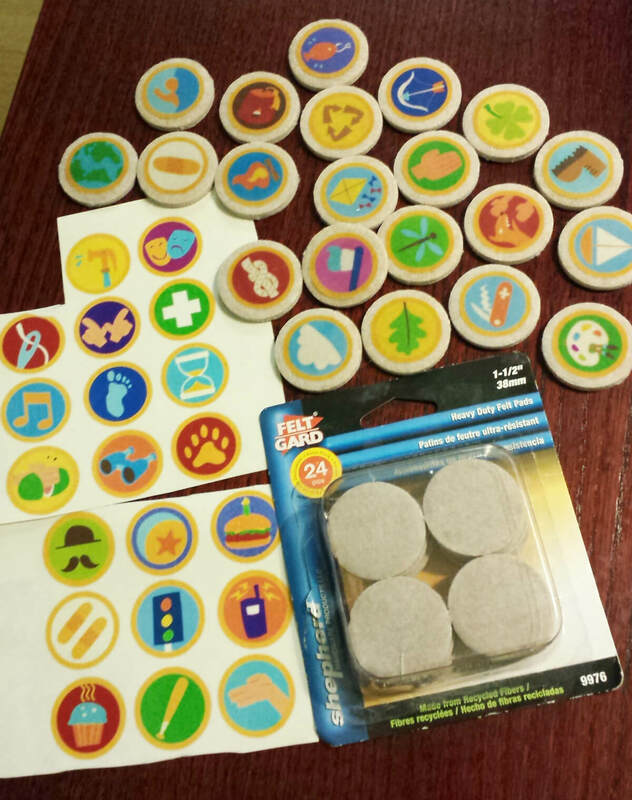 Print Russell’s Wilderness Explorer badges on sticker paper. I went with clear matte sticker paper because I didn’t mind the texture of the felt pad showing underneath. 2. 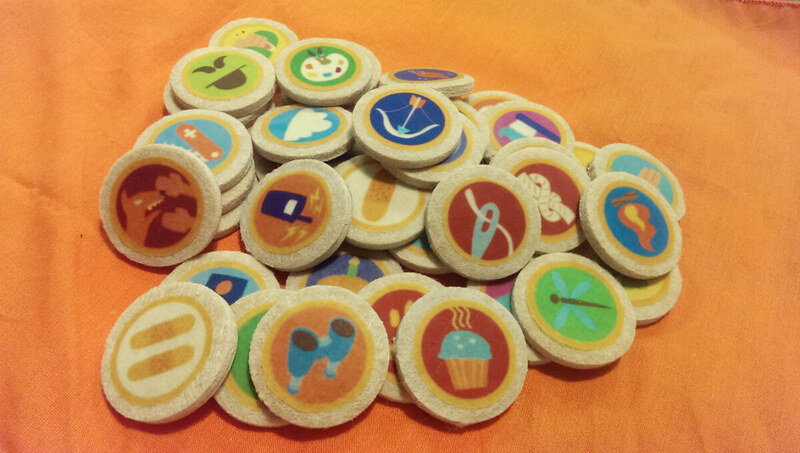 Cut out badge stickers and stick onto the felt furniture pads. As you can see from the photo, I forgot to measure the size of the badge before printing it so there is a little beige border around the actual badge sticker. Since it was such a thin line, I didn’t think it was a big deal but if you want to be exact, be sure to size up/down your badges to match your felt pads width! 4. 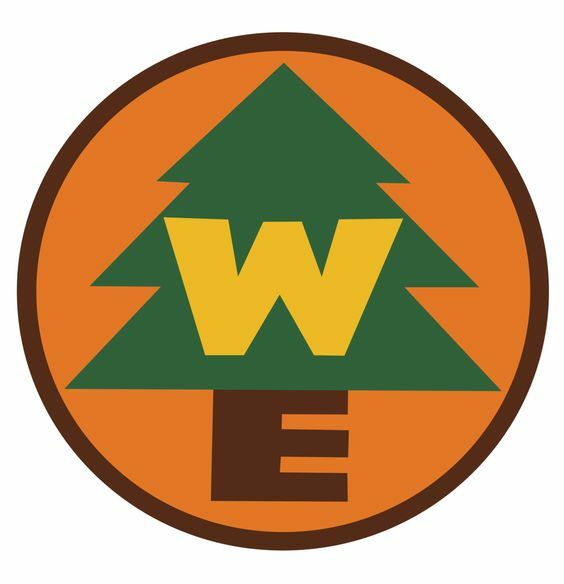 Stick the felt pad badges to your brown fabric in the right order, leaving the space for Ellie’s badge. I would test how well the felt pad adhesive sticks to your sash – I’ve seen some people use a hot glue gun the badges when they’re using a felt sash. 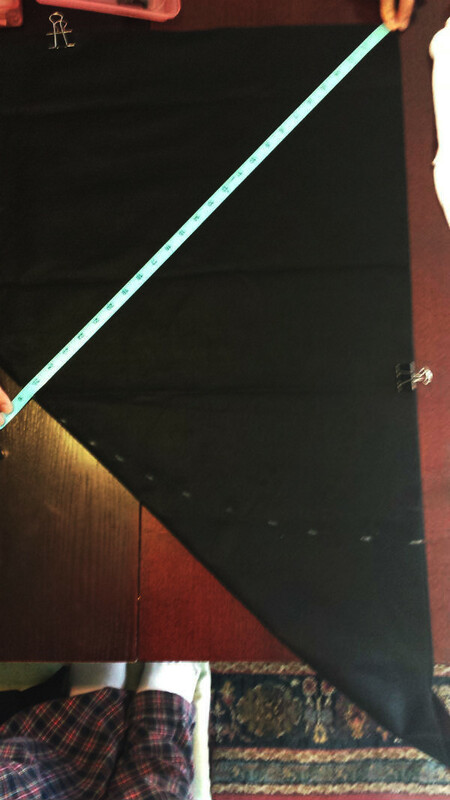 The heavy duty felt pads I got stuck pretty well to my window drape fabric without any additional adhesive. 5. 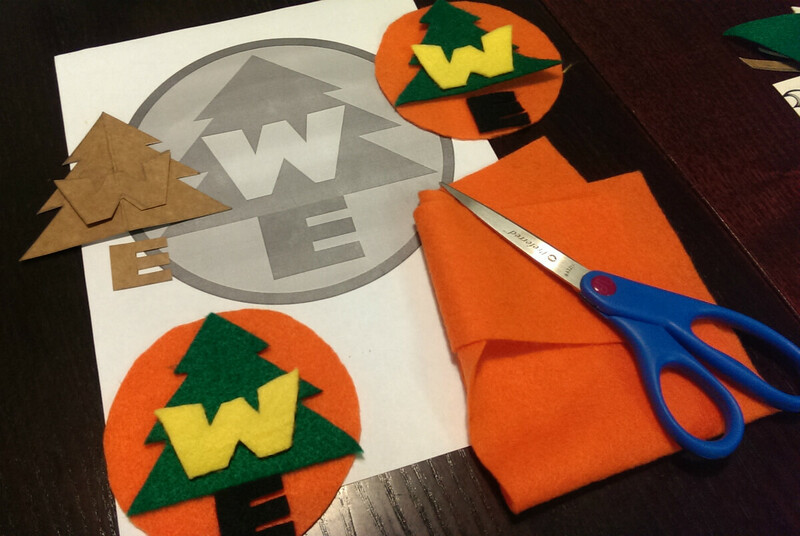 Print the Wilderness Explorer Logo and cut the pieces out to trace on your colored felt. 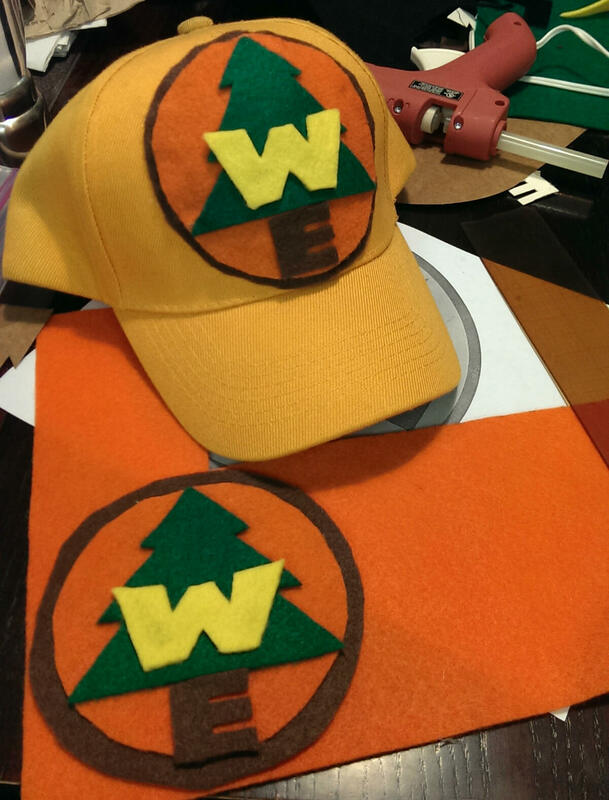 Cut the different pieces of felt and assemble 2 badges. 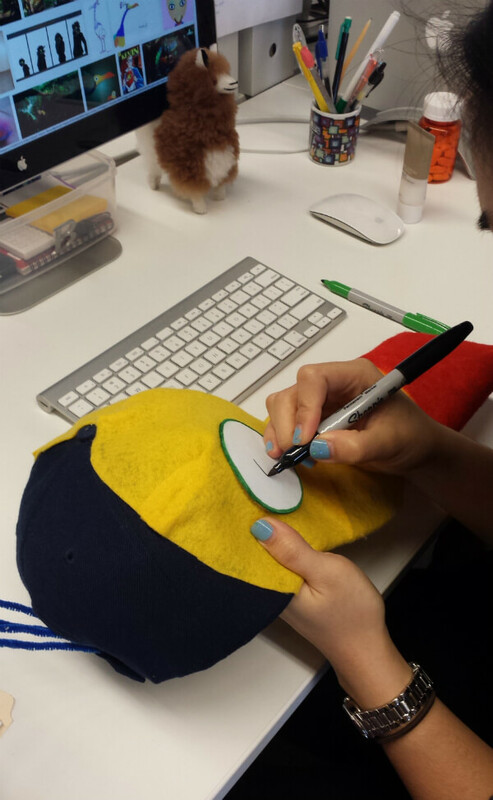 Use the hot glue gun to attach the badge to your yellow cap. 6. 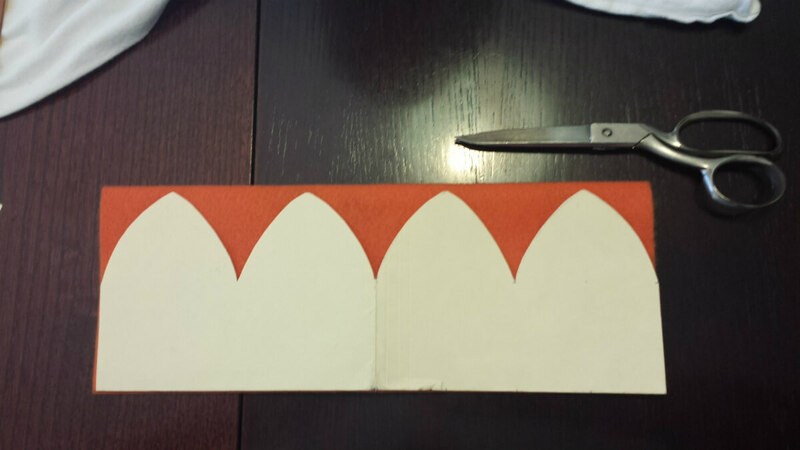 Cut 2 pieces of orange piece of felt into triangles and glue onto both sides of cardstock or cardboard to make a solid base for the flag. 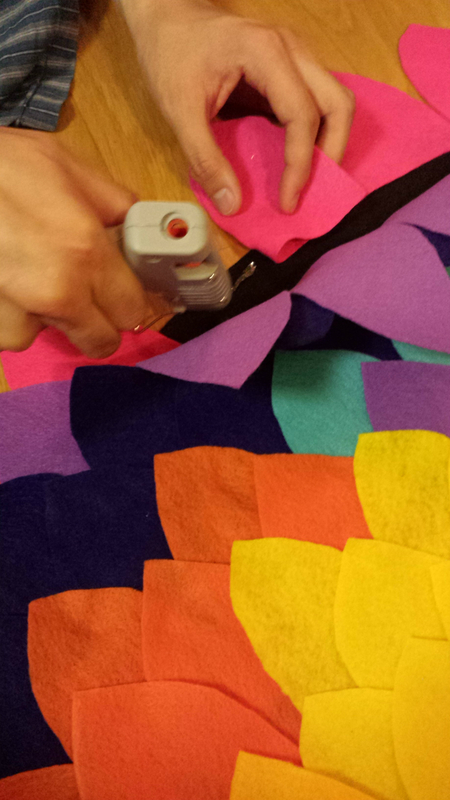 Use the hot glue gun to attach the badge to the flag and again to attach to the wooden dowel. I know it was lengthy, but I hope this tutorial was helpful! Good luck and Happy Halloween! If you’re looking to save a couple bucks on purchasing table number holders, here’s a simple DIY tutorial on how to make your own golden frames to use as table numbers! I had 26 tables so I ordered 28 frames (2 extra for testing/mistakes) and a 6 pack of Rustoleum Specialty Metallic Gold spray paint. I did a lot of research around which gold looks best and this one was generally the consensus for a bright, brassy gold. Anika’s DIY Life has great color comparison photos of 8 different gold spray paints if you’re looking for a different shade of gold. In terms of number of spray paint cans, I think I ended up using around 2.5 cans for all the frames. I used 2 other cans for spraying my 175+ geometric orb favors/centerpieces and my gift card box (posts to come!). A ventilator mask. I know there are high tech ones that look like hazmat suits but for such a small project, I just got this Chemical Odor Valved Respirator from Amazon. The extra valve helped keep my face from getting too hot and sweaty inside, which is what would happen if you used a simple dust mask. 1. Slide out all the plastic frame covers from the Tolsby frames, and assemble the bottom stand with the frame. Optional: The plastic frames should be smooth already but it’s nice to wipe off any dust/lint from your frames with a tack cloth. I didn’t do this before spraying and I noticed that you could see the dust particles on some frames (not enough for your guests to notice!) Instead I wiped all the frames with the tack cloth after they were painted just to get off that extra layer of dirt/dust that might have gathered from being outside. 2. Find a spot outside where you can spray paint without getting the paint on anyone’s car/property and lay down your cardboard box/plastic tarp. Spray painting outdoors is better for ventilation, and you don’t run the risk of having a thin layer of paint particles all over your house. Important:Shake the can of spray paint for a several minutes before getting started to make sure the paint is mixed well. Do a spot test spray to see how far you need to be to achieve the color you want. I was about 6-8 inches away. Side note: Don’t spray paint on a windy day. The first day I tried painting, my frames got knocked down by a giant gust of wind and ruined my first layer! Ideally temperatures should be between 65°F and 85°F, when it’s not very humid. 4. Apply second coats to cover any spots where you can still see the original white frame. Since it was a dry, sunny day, the paint dried pretty quickly so I was able to do additional coats 5 minutes after to cover any spots I missed. It’s a little tricky to get the bottom corners covered so I waited another 20 minutes after I finished the last one to lay them down all on their sides so I can spray the bottom stand and the bottom corners all at once. Let the frames get completely dry for at least 24 hours before handling them. The next day I wiped them down with the tack cloth because I didn’t like the dusty texture and now that I think about it, the frames might have been dusty because I was spraying every new frame in front of the last ones, so the extra spray particles probably just stuck on the ones behind it like dust. 6. Finally, sandwich your two 4″ x 6″ table number cards between the plastic frames and slide it in through the top of the stand. And you’re done! Here is my table number next to our center piece and our also handmade golden geometric orbs holding air plants favor 🙂 Took me a long time to make 150 of those but it was well worth it. Maybe a tutorial to come? Let me know if you’re interested by leaving a comment! Funny coincidence: At our rehearsal dinner, restaurant used Ikea Tolsby stands painted with a dark rust color for our table signs!